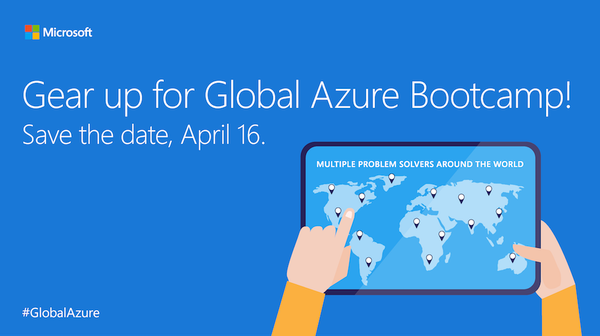 Global Azure Bootcamp is around the corner, It’s a one day world-wide event, driven by Microsoft Azure experts and community enthusiasts, to help developer new to Azure as well as experienced developer, to learn and share knowledge. This is the 3rd year for this event. For the last event in 2015, there were 182 event locations in 54 countries. 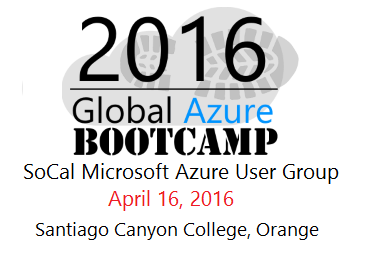 For 2016, there are more locations than before, more deep dive sessions by experts, in different region of the world, scheduled to host the Global Azure Bootcamp on April 16, 2016. In addition to learning and sharing information about Azure, the hands on lab will feature pooling a huge global compute farm to perform research for charity. We are excited to be part of this exciting event! Parking for the event is free in the student parking lots on campus. On the day of the event, we make arrangement with the campus parking authority to allow free parking and will not issue parking citation on the day of this event. Microsoft Azure Subscription. Don’t have one? Get a free trial subscription here. Visual Studio 2015. Free versions are available here if you don’t already have it. Azure .NET SDK for Visual Studio 2015. Also free and available here. The event is organized with developer and IT Pro audience in mind and will be comprised of presentations, demos, and labs that cover various Azure topics. This is a community driven event hosted by SoCal Microsoft Azure User Group to help developer community in the Southern California region to learn and take advantage of the Azure cloud platform. While we don’t have all the details on prizes as yet, we will be passing out swag and prizes like last time.